For a Greater Selection of Antique, Estate and Vintage Watch Fobs Please Visit The Shop or Contact Us. 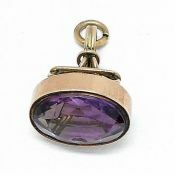 Click Here To Browse Our Pocket Watches. 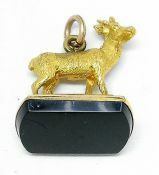 One 15 karat yellow gold banded agate swivel fob. The agate is engraved on one side with a wine glass with two serpents on either side. One 15 karat rose gold watch fob. One monogrammed agate (72.63 carats). 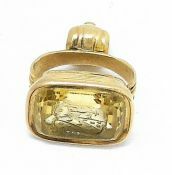 One nine karat yellow gold watch fob. One natural bloodstone (5.08 carats). One nine karat yellow gold watch fob. One amethyst (8.00 carats). 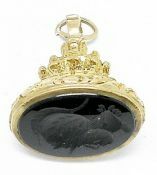 One nine karat antique watch fob with seal. 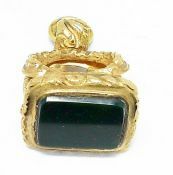 One black onyx (6.23 carats). 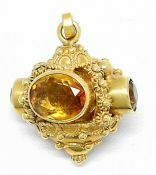 One 18 karat yellow gold hot wax seal fob. 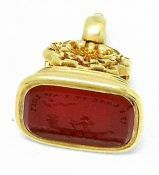 One carved carnelian (8.09 carats).